Received USAF pilots wings in 1953 and was assigned to Germany. Graduate of the USAF Experimental Test Pilot School, Edwards AFB, California, 1959. Assigned to Wright-Patterson AFB, Dayton, Ohio, as a test pilot until selection by NASA. 1963, assigned to Flight Control Systems for Gemini. 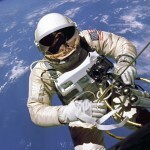 1965, became the first American to walk in space during the Gemini 4 mission, spending 21 minutes of his 36 minute EVA outside the space craft. 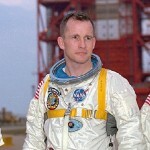 1966, originally the Back-up Command Pilot for Gemini 7, he was reassigned as the Senior Pilot for the first manned Apollo mission. 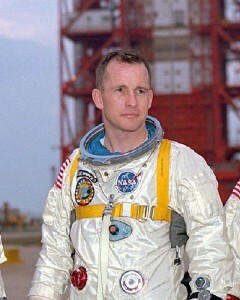 1967, Ed White was killed, along with crewmates Gus Grissom and Roger Chaffee, in the Apollo 1 fire at Kennedy Space Center. The official cause of death was asphyxiation. He was buried with full military honors at West Point.